There is an interesting resemblance between our national flag and Liberia's national flag. This ensign actually has intended to display the ex-American slave origins of the republic. 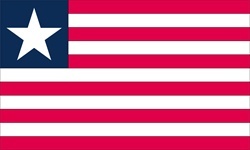 The republic of Liberia offers registration under its national flag. A good number of companies do so for beneficial tax purposes and some other restrictions that countries around the world tend to enforce. This ensign features eleven horizontal stripes in two alternating colors, red and white. The Liberian stripes symbolize the eleven men who signed the republic's declaration of independence. The white five-pointed star on the blue field symbolizes the fact that at the time of the nation's independence, it was the only country in black Africa to be such. The blue colored field stands for the continent of Africa. Today, this national ensign is flown throughout the nation from poles of all kinds, including wooden flag poles. Click here for more information on the national flag of Liberia.